Source: The Junior League of Lafayette, Inc, Tell Me More: A Cookbook Spiced With Cajun Tradition and Food Memories (Dallas: The Wimmer Companies, Inc, 1993), 96. 02. Preheat oven to 350ºF if serving today; otherwise skip this step. 03. In a mixing bowl, combine the potatoes with all of the remaining Casserole ingredients; spoon into 9- x 13-inch baking dish. 04. Mix the Topping ingredients; sprinkle over the casserole. If you are preparing this dish in advance, stop here, wrap and freeze. 05. Bake in the preheated oven for 45 minutes. 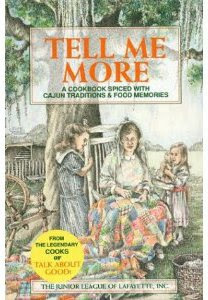 1 Source: The Junior League of Lafayette, Inc, Tell Me More: A Cookbook Spiced With Cajun Tradition and Food Memories (Dallas: The Wimmer Companies, Inc, 1993), 96.